Choreographers Sarah Weber Gallo and Whitney Jacobs join forces for this evening-length devotion to all things FUN. As the dancers careen through layers of excess, effort, risk, messiness, laughter, extreme embarrassment, and the inevitable morning after, The Sarah and Whitney Show makes space for our collective need to seek pleasure, companionship, and debauchery. Because WE WANT YOU TO HAVE MORE FUN! Celebrating effort, excess, risk, and gigantic messes, The Sarah & Whitney Show is devoted to all things FUN! 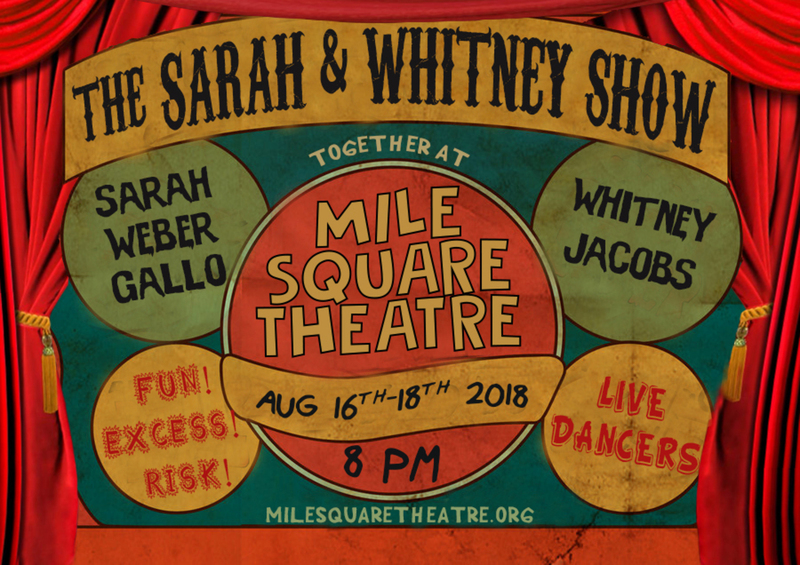 Choreographers Sarah Weber Gallo and Whitney Jacobs invite audiences to Mile Square Theatre for three evenings of free-range dance in celebration of our collective need to seek pleasure, companionship, debauchery, and laughter! Sarah Weber Gallo is the Artistic Director of SWG/dancetheatre, and the Dance Director for Mile Square Theatre, where her 2016 production The Magic Hour had its world premiere (“Stunning!” - Dance Enthusiast). She is the senior dancer for the Metropolitan Opera Ballet at Lincoln Center.